As I rolled out this batch of dough, I realized it would not fit on my stone. Rather than split it in two, I pushed it into the perfect sized rectangle for my half sheet pan. I’m glad I did, and this pizza was so stinkin’ good. 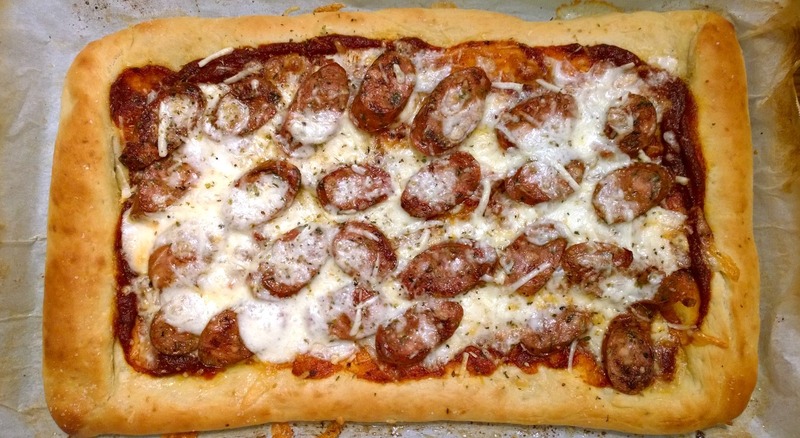 I used this Italian chicken sausage that I crisped up in a large skillet, while the crust was par-baking in the oven. 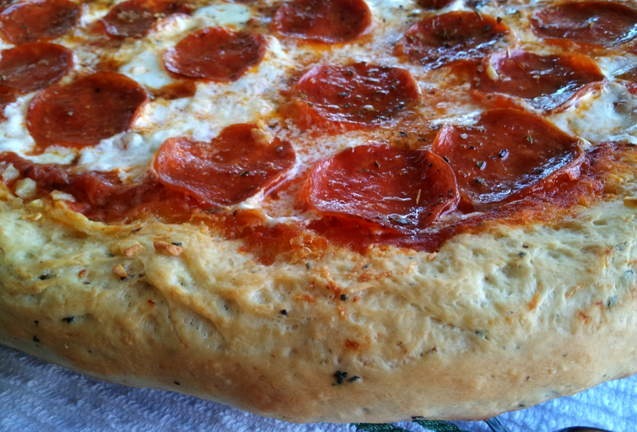 I used at least four types of Italian cheeses on this and flavored the crust with olive oil and other seasonings. My family loved this pizza and my son requested it for his birthday dinner 🙂 Thanks for reading, enjoy! Preheat oven to 475. Place a pizza stone on a rack placed on the lowest level of the oven. Roll out dough onto parchment lined sheet pan, drizzle with olive oil and bake for 5 minutes. Top the crust with pizza sauce and bake for another 5 minutes. Spread about 1/2 the shredded cheese on the top, and bake for another 5-7 minutes. Using a pastry brush, paint the crust with olive oil, sprinkle with garlic powder and kosher salt, sprinkle with oregano all to taste. Top with browned sausage and the remaining cheese, bake until golden brown and bubbly – about another 7 minutes. Take a peek at the bottom of the crust to make sure it’s golden brown – if not, continue baking until it’s done. Verdict: This was seriously good! 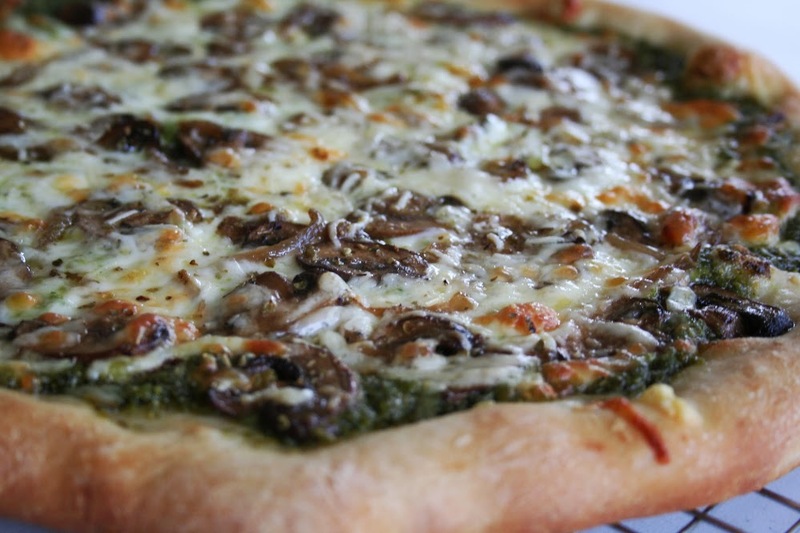 My friend said it was the best thing she’s ever eaten – maybe that’s just because she’s pregnant and super sweet, but I’ll take it 😉 The kale pesto has rich flavor and a garlicky bite, and the sautéed mushrooms are savory, meaty and absolutely perfect! It’s a new favorite for the both of us, and I’m sure we’ll enjoy this one again soon. Thanks for reading, enjoy! In the bowl of your stand mixer, combine all of your ingredients, and stir until a loose dough forms. Attach the dough hook to your mixer and set the speed to 2, continue kneading adding more flour if necessary. You don’t want the dough to be too sticky, but a little tacky is good. 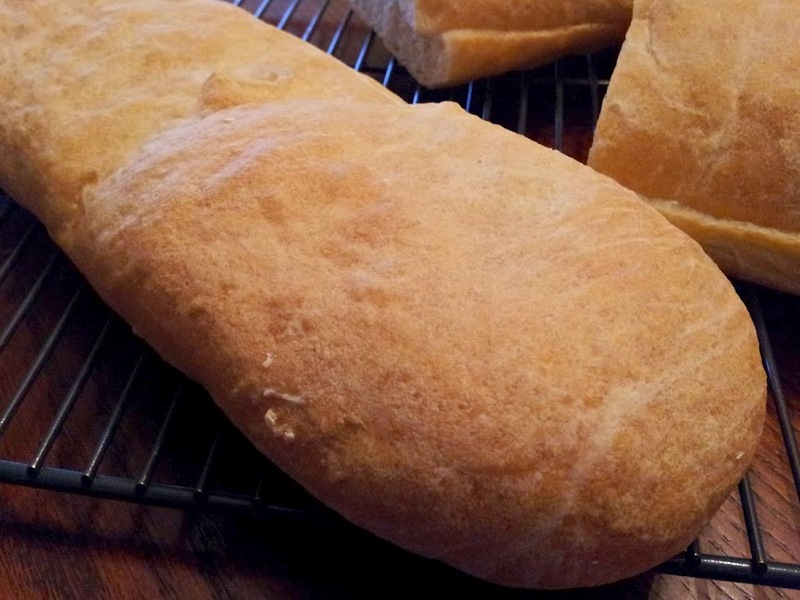 Knead for 5-7 minutes or until smooth and elastic. After kneading is finished, turn the dough out onto a lightly floured surface and gently shape it into a ball. Place the ball in a large, lightly oiled bowl and cover with plastic wrap. Let it rise until doubled in volume – about an hour. Divide the dough into two pieces; you only need one ball for this recipe. Heat a large skillet over medium high heat. Add extra-virgin olive oil and butter. Add onions and cook 5 minutes, then add the mushrooms to the pan. Continue cooking until the veg is evenly browned and tender. Season with salt and pepper to taste, and continue to cook down for a few more minutes until the pan is mostly dry. Set aside. Place a pizza stone on a rack on the lowest part of your oven. Heat to 475 – 500 degrees. Flatten your dough into a disk until it’s as thin as you like it (I like mine around 1/4 inch, and about 12 -14 inches in diameter). 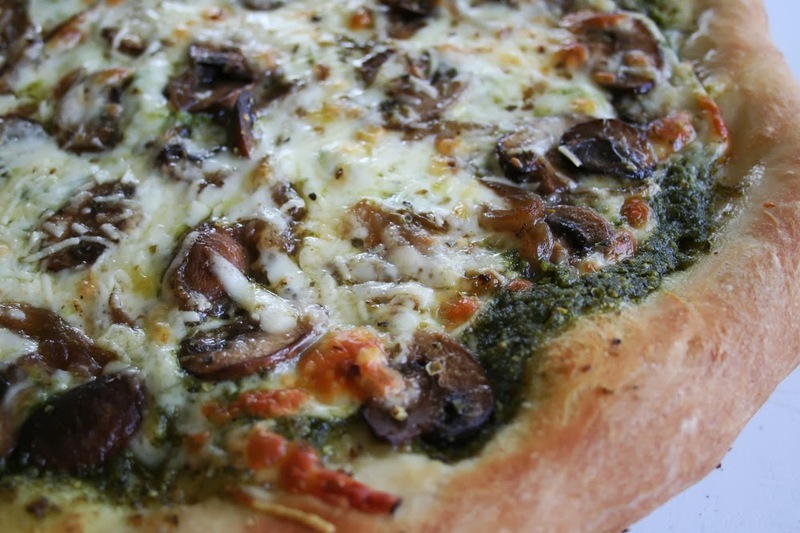 Spread the pesto over the dough leaving about 1/2″ border uncovered. Sprinkle with cheese, then top with the mushroom and onion mixture, and then top generously with more cheese. Bake in the oven for 8-10 minutes or until the crust is golden brown, remove from oven and let cool slightly before slicing. 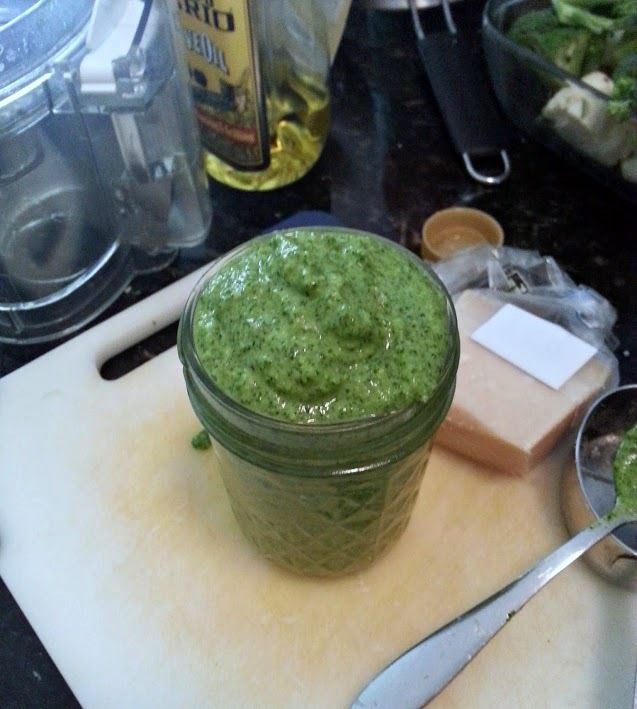 Add the kale, garlic and cashews to a blender or food processor. Blend for 30 seconds. Add the salt, pepper, olive oil and water. Blend until all ingredients have been incorporated (30-60 seconds). Add the parmesan cheese and pulse for 5-10 seconds. Serve with pizza, pasta or your favorite dish. 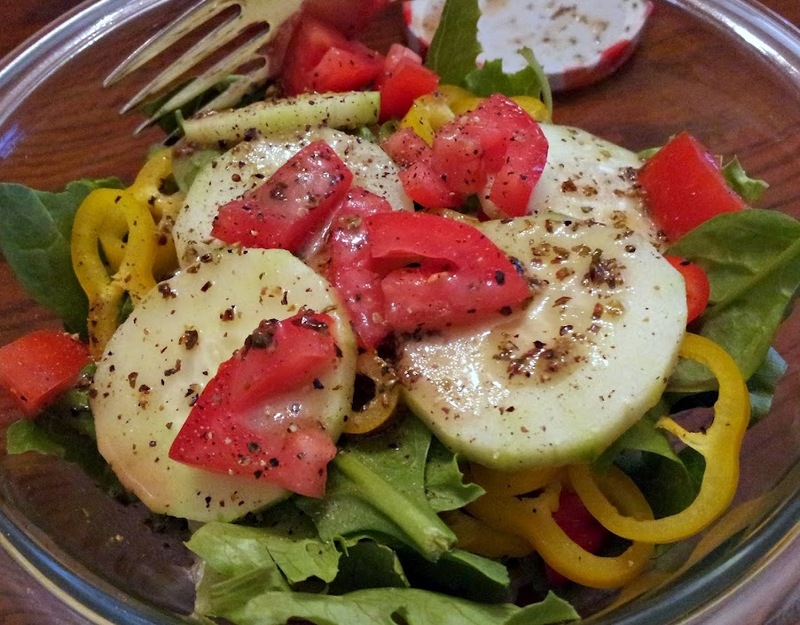 My sister shared this simple and satisfying recipe while we were vacationing in California. 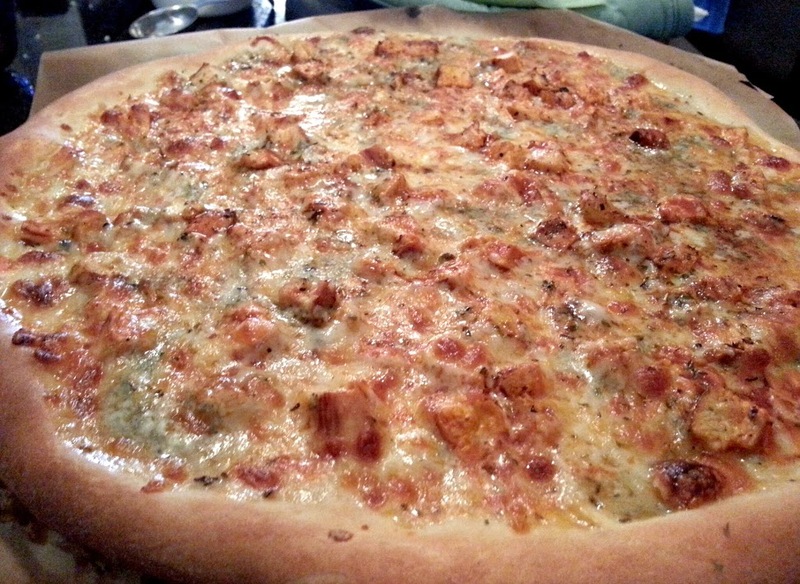 We made four awesome pizzas together and this one was the standout! We used leftover pollo asada that Dad marinated and grilled the day before. Not even he knows what he threw together for it, so I improvised a super simple marinade for my chicken. I will make this again next week for company – I hope they love it 🙂 Thanks for reading, enjoy! Preheat oven to 475 degrees and place a pizza stone on top of a rack set at the bottom of your oven. Place a skillet over medium heat; add the butter and Frank’s Red Hot. Heat just until butter has melted, then add chicken and coat with buffalo sauce. Turn off heat and set aside. Press dough out into a pizza round about 13 inches in diameter and then dock center of pizza dough. With a slotted spoon remove chicken from skillet and place on pizza dough, making sure you don’t coat the bottom in a thick layer of sauce; unless you like soggy pizza 😉 Generously cover the chicken with your cheese. 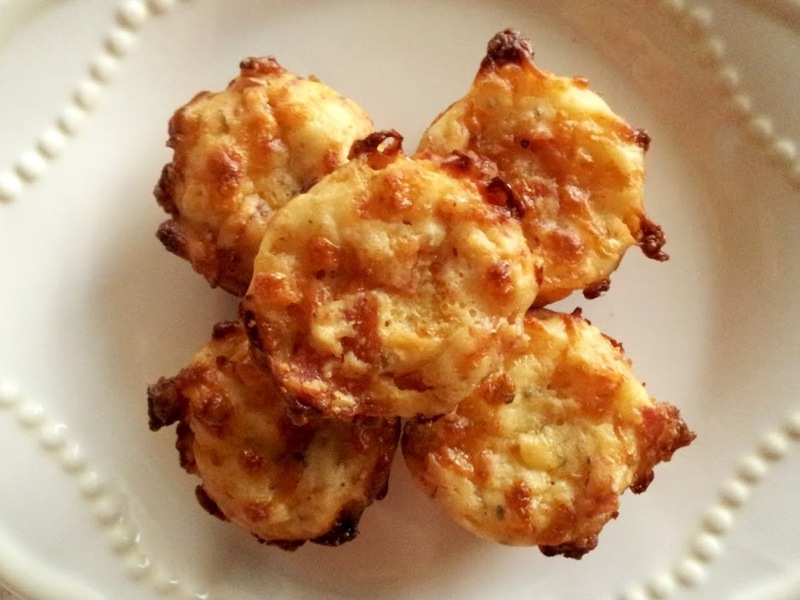 Bake for 8-10 minutes or until crust and cheese are golden brown. Serve and enjoy! This was a great, little twist on a classic combination. Thanks for stopping by! Preheat oven to 450 degrees, place rack on lowest position and place a pizza stone on top if you have one. 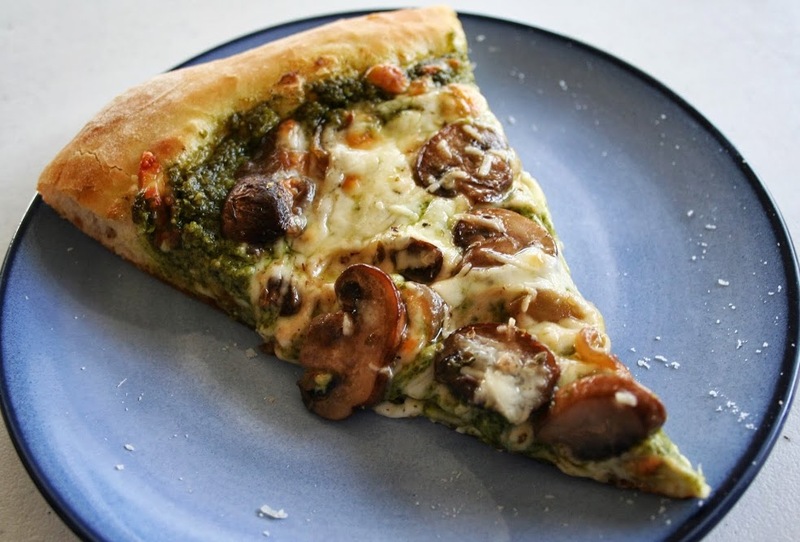 Lightly work the dough to your desired diameter, top with sauce, cheese and other toppings. Bake for 10 minutes or until golden brown and bubbly. If I was going to have to watch football, I was going to make up for it by enjoying some junk food at the same time 😉 I was pretty excited to find all the necessary ingredients in my fridge to make this, and just enough pizza sauce and pepperoni left in the freezer. The only thing I didn’t have on hand was a baguette, but tortilla chips were a fine substitute. This came together quickly, and the measurements aren’t too important to follow exactly (“There’s too much cheese in this” – said no one ever!) Thanks for reading, enjoy! Mix the cream cheese, sour cream mayonnaise, half of the mozzarella, half of the parmigiano reggiano and pepper to taste. Spread it across the bottom of a pie plate. 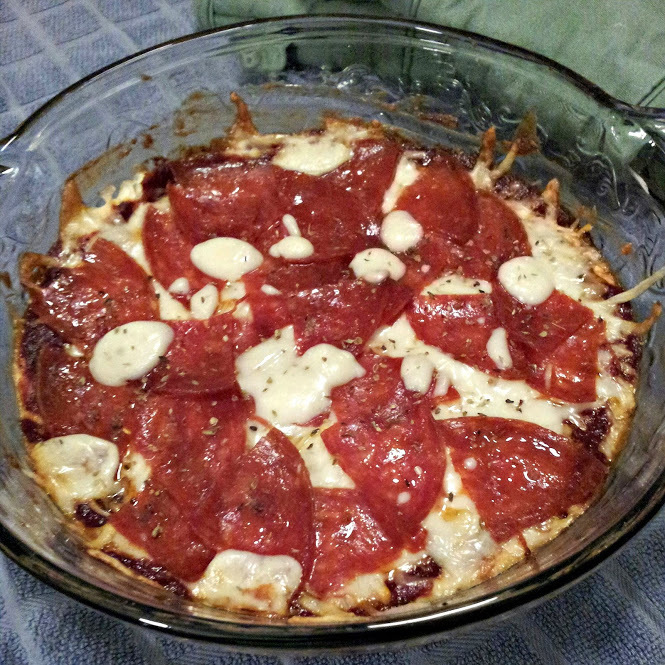 Spread the pizza sauce on top and sprinkle on the rest of the cheeses and pepperoni. Sprinkle oregano over top if desired. Bake in a preheated 350F oven until the sides are bubbling and the cheese has melted and turned golden brown on top, about 20 minutes. In an effort to give my kids something other than sandwiches (I would have gotten burned out on those a long time ago), I decided to make these. The best were so easy to make and the kids loved them. My son said I should have doubled the recipe so he could have eaten more – but these are pretty big and the kids split one. Thanks for reading, enjoy! Preheat oven to 400 degrees. Grease a baking sheet with non stick cooking spray and set aside. Roll pizza dough into a 12×18 inch rectangle and cut into 4 strips width wise (so you’d end up with 4 pieces of dough that are 4 1/2 inches x 12 inches). Divide pizza sauce between all 4 slices and spread, leaving a 1/4 inch border approximately. Shingle the slices of pepperoni on top of the sauce. Top with mozzarella cheese (1/2 cup per pizza roll) and cheddar cheese (2 tablespoons per roll).Roll up each piece of dough and place on prepared baking sheet seem side down. Press the open edges down to seal. Bake for 20-25 minutes or until tops are golden and bottoms are brown. 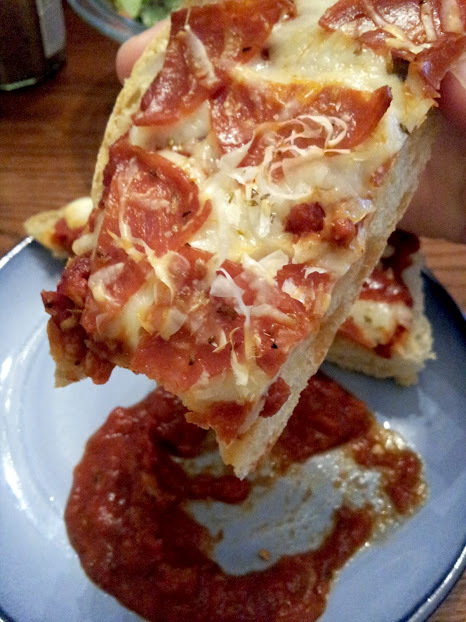 Serve warm with more pizza sauce for dipping. Quick Post: These were amazing! I tried out a new bread recipe that worked out really well for these, and this Greek dressing was a great addition to our green salad. Thanks for reading, enjoy! In a stand mixer fitted with a dough hook, combine the flour, yeast, sugar, olive oil, and water. Mix on low speed until a dough forms and pulls away from the sides of the bowl. Add the salt and increase the speed to medium; knead for 10 minutes. Turn the dough out onto a lightly floured surface and form it into a ball. Lightly grease the inside of the mixing bowl and return the dough to the bowl. Cover with plastic wrap and set in a warm, draft-free space to rise for 1 1/2 hours, or until doubled in size. Turn the dough out onto a lightly floured surface and gently deflate the dough. Divide the dough in half and form into balls. Cover with a clean kitchen towel and allow them to rest for 15 minutes. Form each ball into a 16 x 2 inch loaf. Place the loaves onto a large parchment lined baking sheet, cover with a damp cloth, and set aside in a draft-free space to rise for 1 1/2 hours. Preheat the oven to 375º F. Bake the loaves until golden brown, about 30 minutes. Transfer to racks to cool completely. Slice and serve at room temperature or rewarm before serving. Enjoy! Preheat your oven to 400 degrees and line a baking sheet with foil. 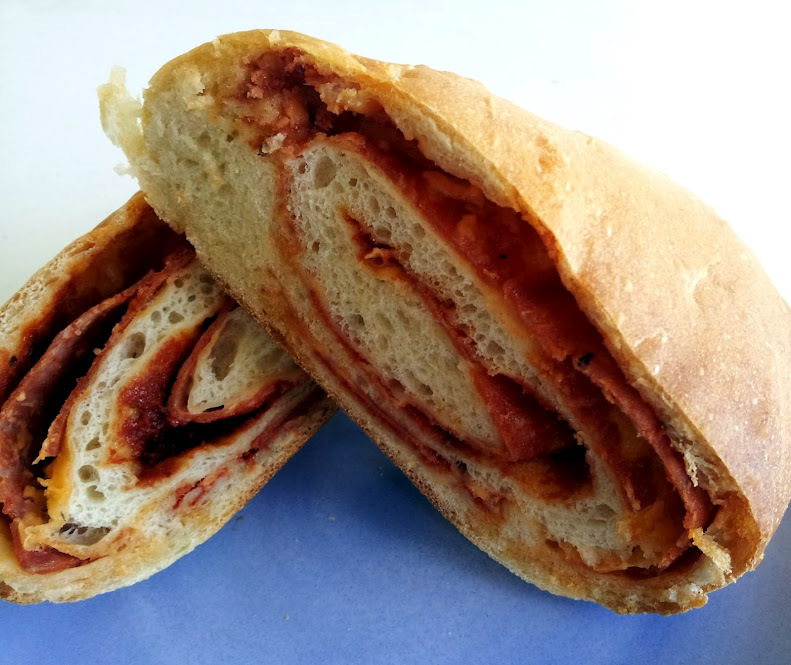 Cut your baguette into the size you want your pizzas. 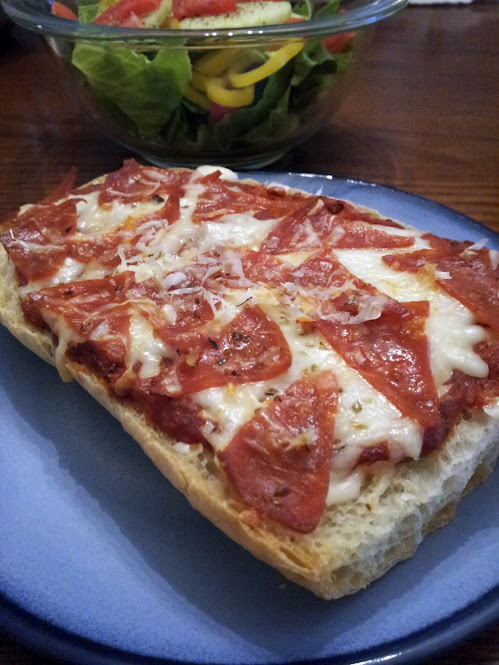 I had a half length baguette so I cut it in half (lengthwise) then sliced it open to make four pieces, each about 8 inches long and four inches wide.Top each pizza with about 1/4 cup of sauce and 1/4 cup of shredded cheese. I like to sprinkle on a little extra Italian spices at this point to kick up the flavor. 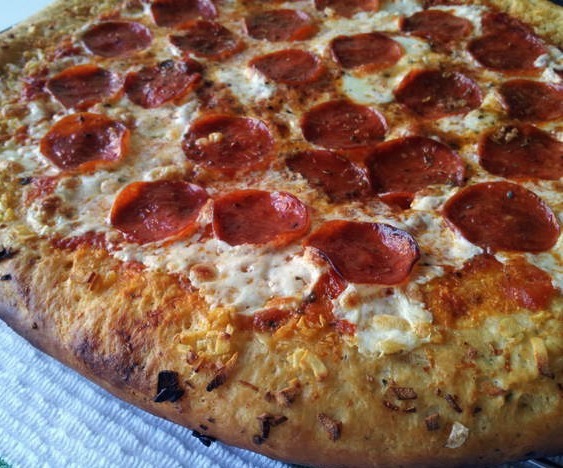 Follow this up with pepperoni or whatever other toppings you are using. Bake the pizzas in the oven at 400 degrees for 10 to 15 minutes or until the cheese is melted and bubbly and the edges of your bread are brown and crispy. Mix all ingredients in a glass jar, shake and place in the refrigerator for at least 30 minutes before using. Verdict: These were really good and would make a great appetizer. 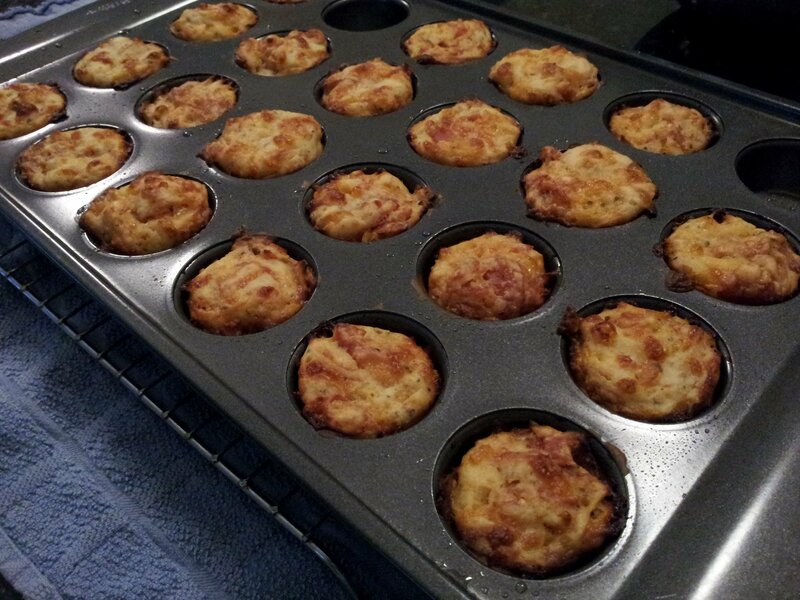 The ratio of cheese and pepperoni is quite a bit higher than batter, so oil up your muffin tin liberally! I like my addition of chili flake which gave these a little kick. Also, marinara is a must for dipping which makes these little puffs a quick substitute when you’re craving pizza. Thanks for reading, enjoy! Preheat oven to 375o. Grease a 24-cup mini muffin pan. In a large bowl, whisk together the flour, baking powder and dried seasonings; whisk in the milk and egg. Stir in the mozzarella and pepperoni; let stand for 10 minutes. Stir the batter and divide among the mini-muffin cups. Bake until puffed and golden, 20 to 25 minutes. Warm the pizza sauce, then stir in 1 tablespoon basil. Sprinkle the puffs with the remaining 1 tablespoon basil. Serve the puffs with the pizza sauce for dipping. Quick Post: I found this on Pinterest the other day and knew that this would be on the menu this week! We finished the whole pizza 🙂 Next time I will have to double the recipe to make sure there are leftovers. I love the texture of the crust because the butter made it slightly toasty and pleasantly crisp. I will make this again, but I will plan ahead next time to let this dough age in the fridge for a few hours to give the dried herbs and garlic powder time to meld and flavor the dough. Thanks for reading, enjoy! In a large bowl, combine water, yeast, honey and olive oil. Mix with a spoon, then let sit until foamy, about 10 minutes. Add in 2 1/2 cups flour, salt, garlic powder and dried basil, stirring with a spoon until the dough comes together but it still sticky. Using your hands, form the dough into a ball and work the additional 1/2 cup flour (you don’t need to use all if it is not needed) in to the dough, kneading it on a floured surface for a few minutes. Rub the same bowl with olive oil then place the dough inside, turning to coat. Cover with a towel and place in a warm place to rise for about 1 hour. 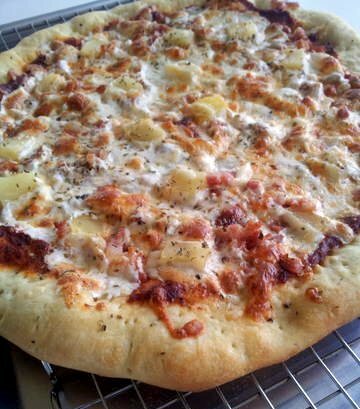 Once the dough has finished rising, roll it out and finish with your favorite pizza toppings. I used pepperoni, fresh mozzarella, Pecorino Romano and parmesan cheese. Spoon the garlic butter over the edges of the dough. I baked the pizza off in a 475 degree oven for 10 minutes on top of my pizza stone. This pizza was garlicky, oily and so tasty. It wasn’t “swimming” in oil, but it seeped through to the bottom crust which made it even more crispy, reminiscent of my favorite garlic bread. I meant to add grilled chicken to this, but last night was crazy and this morning my mind was somewhere else; so I completely forgot. Thankfully my disappointment only lasted a for a minute. I made up for the lack of chicken and added another layer of flavor by using sun dried tomatoes to the top of this which ended up being a perfect addition to this pizza. I had to stop myself from eating too much! I’m looking forward to these leftovers 😉 Thanks for reading, enjoy! 1. To roast the garlic: Peel away the outer layers of the garlic bulb skin, leaving the skins of the individual cloves intact. Using a knife, cut off 1/4 to a 1/2 inch of the top of cloves, exposing the individual cloves of garlic. Place the garlic heads in a baking pan; muffin pans work well for this purpose. Drizzle a couple teaspoons of olive oil over each head, using your fingers to make sure the garlic head is well coated. Cover with aluminum foil. Bake at 400°F for 30-35 minutes, or until the cloves feel soft when pressed. Remove garlic gloves and smash with a fork. 2. 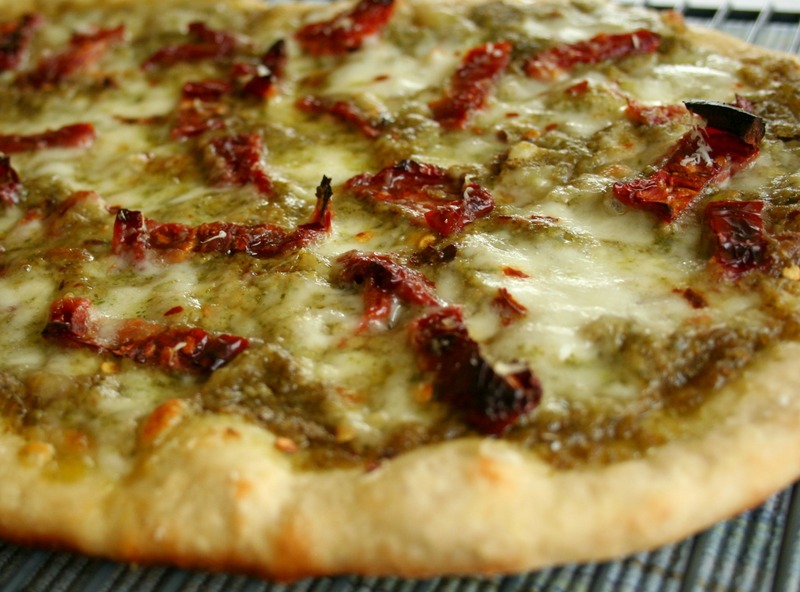 Spread roasted garlic over pizza dough, then top with your pesto, mozzarella and the grated cheeses. Add your sun dried tomatoes and chili flakes then bake for 8 to 10 minutes in a 475 degree oven. 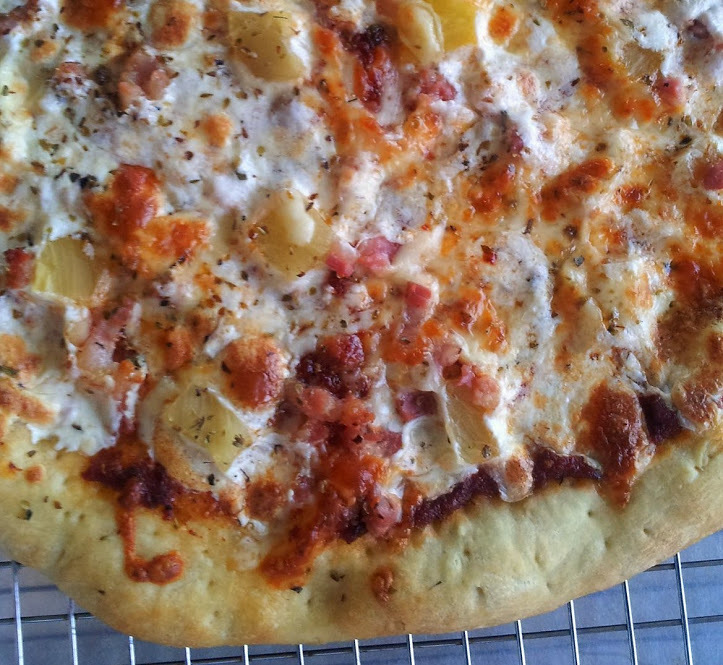 I love using my pizza stone which always sits on the lowest level of my oven.